This tutorial is for FrontPage XP (2002) users wishing to publish a web on Domaindlx or a similar web host. First you are going to have to create your website, I recommend building the entire, or major portion of the website prior to uploading to the web host. Now if you have done this, the website you have created should be in the My Webs folder within My Documents, Open the folder that contains your web and follow the steps below. 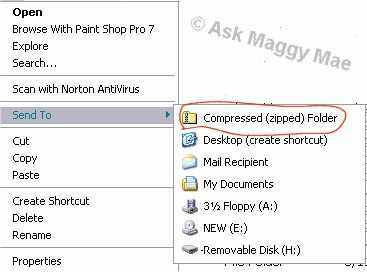 Right click on one of the files or folders and choose "Send to" then choose "Compressed (zipped) Folder. See graphic on the right. Once your entire web is compressed into a zipped file it will look similar to the following graphic. Now it is time to sign in to domaindlx, once signed in you will be ready to start the process of uploading to the website. You should be in the file manager once you have signed in. Be sure you are on the page as shown below. That is your file manager. To upload your zipped web to domaindlx, you first need to click on the arrow beside "Upload" and choose ZIP file. See graphic on the right. Once you choose ZIP file your page will change and you will see what is show in the graphic below. Use the dropdown box beside Look in: to navigate to the folder you saved your zip file into. If you followed instructions above it would be in a folder under My Documents then My Webs, then open the folder holding your web. Find the zipped file (see graphic above, zipped file circled), and highlight it and click on the Open button. The window will close and you will be taken back to the upload page for Domaindlx. Click on the Upload button and wait for the file to be uploaded. At this point it may take a while to upload your web, it will depend on the size of your web. Also this process, once the zipped file is uploaded, it will automatically be unzipped and all files and folder will be in the same place they are on your hard drive. This means no changing your urls for your graphics like when you have to upload to MSN, all graphics, files and folders that are in the web will be uploaded and unzipped into your web space. Once the process is finished it will take you back to your file manager page and you will see the list of files uploaded and unzipped. Your web is now ready to be viewed. Click on the link between the menu buttons and the file list and you will see how your web appears on the site. Once your web is uploaded, you can add pages one at a time also. 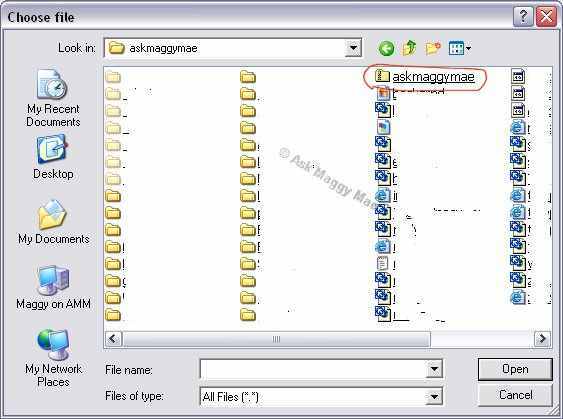 To do this you would choose the "single file" in the Upload menu instead of "ZIP file".